Although most known for widely-publicized photographs that depicted her assault during the 1965 Bloody Sunday civil rights march in Selma, Alabama, Amelia Boynton Robinson lived a long life of civil rights activism in both Georgia and Alabama. Her critical role promoting African American voting rights in the South remains undervalued in published histories of the Civil Rights Movement, but Ava DuVernay’s 2014 Academy Award-nominated film Selma provided some renewed recognition on the eve of Boynton Robinson’s death. Born in Savannah, Georgia on August 18, 1911, Boynton Robinson’s parents emphasized the importance of education and Christian virtue. Her father, George Platts, a skilled construction worker, was related to Robert Smalls, a Civil War hero elected to the U.S. House from South Carolina during Reconstruction. Her mother, Anna Platts, a seamstress, took her on buggy drives to African American communities of rural Georgia to promote woman suffrage. Amelia Boynton Robinson enrolled at Georgia State Industrial College for Colored Youth (now Savannah State University) at fourteen before transferring to Tuskegee Institute to earn a degree in home economics. After teaching briefly in Georgia, Boynton Robinson became a home demonstration agent for the United States Department of Agriculture. Based in Selma, the seat of Dallas County, Alabama, Boynton Robinson traveled about the countryside to promote home canning, nutrition, and agriculture. In 1936 Amelia Boynton Robinson married Samuel William Boynton, the USDA Extension Agent in Dallas County. He shared her commitment to provide support to rural African Americans of the region, most of whom were sharecroppers. Together, the couple used their work for the USDA to promote education, land ownership, and political empowerment. Boynton Robinson’s frustration over African American exclusion from the Selma Community Center led her to write Through the Years, a play celebrating African American history which she used as a teaching and fundraising tool. The Boyntons later opened an insurance company catering to African Americans, a development that allowed the couple to expand their grassroots networking throughout southern Alabama. In the 1930s, the Boyntons joined the fledgling Dallas County Voters League (DCVL) and both served on the steering committee known collectively as the “Courageous Eight.” Amelia Boynton Robinson successfully registered to vote during these years, although local white authorities limited broader African American voter registration efforts. Boynton Robinson remembered posting a sign in her office, declaring “A Voteless People is a Hopeless People.” The couple traveled about the countryside, giving talks and demonstrations on voter registration and when Samuel Boynton died in 1963, Amelia Boynton Robinson used his funeral to rally support for continued political activism. The following year, Boynton Robinson signaled her readiness to attack Jim Crow directly. She registered as a Democratic candidate for a U.S. House seat in 1964, receiving 10 percent of the vote. She also invited Martin Luther King, Jr. and the Southern Christian Leadership Conference (SCLC) to organize from her home in Selma, Alabama. Having met King in Montgomery, Alabama, in 1954, Robinson believed the time was ripe for a concerted protest against Jim Crow in Selma. Despite heavy pressure from Selma’s Sheriff Jim Clark, members of the DCVL worked with the SCLC and with youth activists from the Student Nonviolent Coordinating Committee (SNCC) to expand direct activist protests against segregation and disfranchisement. On March 7, 1965, Boynton Robinson and almost six hundred marchers gathered to march from Selma to Montgomery in protest of the recent murder of civil rights activist Jimmie Lee Jackson by an Alabama state trooper. Marchers walked from the Brown Chapel A.M.E. Church toward the Edmund Pettus Bridge where they were attacked by state troopers and local deputies. The march became known as Bloody Sunday as television and print journalists captured the violence, including an image of an unconscious Boynton Robinson, clubbed for refusing to retreat. Over seventy marchers were beaten and seventeen hospitalized. This media attention sparked national outcry over the South’s resistance to the Civil Rights Act of 1964 and pushed President Lyndon B. Johnson to sign the Voting Rights Act in August 1965, with Boynton Robinson in attendance. She continued to be politically active in following years. She moved to New York briefly after marrying musician Bob Billups in 1969. After his death in 1972, she returned to Alabama, ultimately settling in Tuskegee after marriage to an old classmate, James Robinson. Boynton Robinson became involved with right-wing political activist Lyndon LaRouche, and served as vice-chair of his think-tank, the Schiller Institute. This association was divisive as many African American civil rights leaders charged LaRouche with a lack of real commitment to equal opportunity, suggesting he was exploiting African American recruits with empty promises and inflammatory rhetoric. Despite this controversy, Robinson was recognized in 1990 with the Martin Luther King Jr. Freedom Medal. She also traveled to Washington, D.C. in 2015 to attend President Barack Obama’s State of the Union Address where her life service was acknowledged. 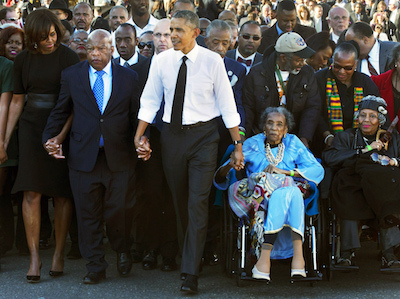 Amelia Boynton Robinson died on August 26, 2015, not long after having viewed her role in Bloody Sunday depicted in the Oscar-nominated film Selma. Her life represents the deep roots of civil rights activism in the rural South and the important role of African American women within these grassroots traditions. Amelia Boynton Robinson, Bridge Across the Jordan (Washington, D.C.: Schiller Institute 1991); Denise L. Berkhalter, “Bridge over Troubled Water,” Crisis 112 (March/April 2005); Margalit Fox, “Amelia Boynton Robinson, a Pivotal Figure at the Selma March, Dies at 104,” New York Times, August 26, 2015; and “Amelia Boynton Robinson and the Dallas County Voters League (DCVL),” at: https://www.teachingforchange.org/boynton-robinson-and-dcvl.